The first Legendary Event in Star Wars Galaxy of Heroes for 2018 is finally upon us as One Famous Wookie will give players the chance to unlock Rebel Chewbacca. 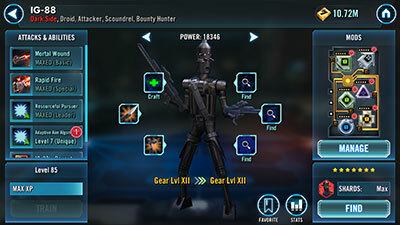 The first Legendary Event in SWGoH since Rey’s Hero’s Journey in December 2017 allowed us to unlock Rey (Jedi Training) for the first time, players will need to use five Bounty Hunters to capture the wookie hero of the Original Trilogy who also appeared in Episode III and briefly in the Clone Wars. For the One Famous Wookie event our Director of Content will live blog his efforts. 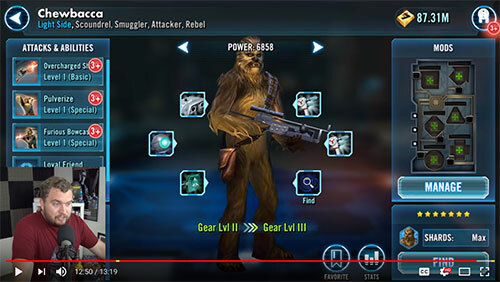 Much like his live blog of the Grand Admiral Thrawn, RJT and BB-8 events, LJ will detail the character levels, gear levels, mods, mod types and mod levels for each of the five toons used in the event to (hopefully) unlock Rebel Chewbacca. Details of the Live Blog attempts will be posted below. Keep checking back and hit “refresh” in your browser for updates to this page with all details below and be sure to add your comments below or Tweet them to @GamingFansDFN on your experiences as well. First off, all of this will take place on my personal account, not the GameChangers account for reference. I am starting this event without mods on my Bounty Hunters. I am fully aware of the fact that my mods and gear levels are not attainable by all players and I apologize if you cannot relate. 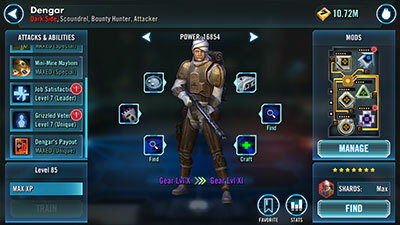 I feel that this example will show players the value of mods in the game and we here at Gaming-fans.com are happy to assist if you need help modding SWGoH characters. I can tell you that I have been saving up all gear, mod slicing materials and have better mods in reserve if needed to ensure that this event is a success in the end. Because I have a full day I have to get up early to get my first few attempts in for the community. I will likely not be able to actually open Chewie until later in the day, but I am looking to give the SWGoH community as much as I can. 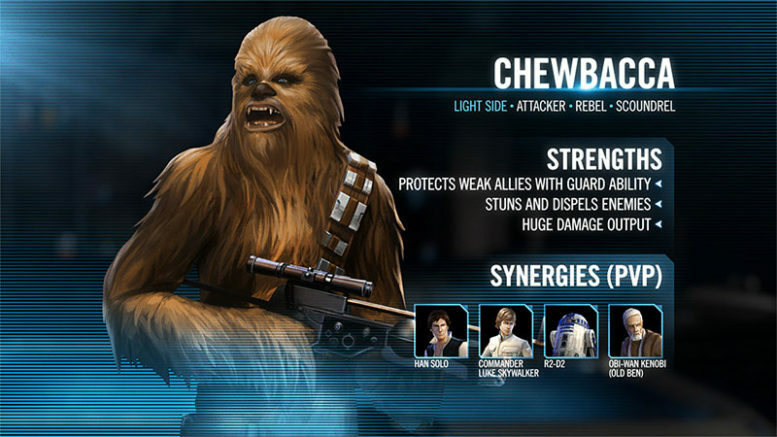 I will be online between 5 and 5:15 am ET to start the Live Blog to unlock Chewbacca. Tier I – Ok, to start, the graphics and scene are great. Love the Cloud City use. Tier I was almost over with a single Boba Fett AOE – now on to Tier II. Tier II – Tier II was more of the same – for this crew VERY easy. Tier III – My lack of Speed is starting to catch up with me here. IG-88 is stunned immediately and I take a few hits to start, however a few Thermal Detonators later and all is well. On to Tier IV. Tier IV – Very similar to Tier III, I may have performed better. Took a few hits but the gear strength of my characters is ensuring the early battles are not even close. With that, I will add my regular mods to all five of my Bounty Hunters and continue below. Ok, lunches are packed, I finally have some coffee and a breakfast sandwich and I am equipping mods again. We’ll be fighting Tier V again shortly. Tier V – Even with my mods equipped these Rebels are fast! Dengar is stunned and Zam places he detonators, now Dengar is up. Boba nearly took out ROLO himself before a little help from his friends, now to focus on the rest. Zam and Dengar need more Potency in this event – neither are getting debuffs to stick well enough IMO. Zam is at 72.73% and Dengar 89.53% – and this is Tier V! Lando and R2 are out of the way, now it is Han and Chewie remaining and someone should have told Han the odds since they were not good. Moving on to Tier VI. Tier VI – Despite 248 Speed on Zam Wesell, the Rebels took 7-8 turns before I even got started and Bossk is stunned with almost all Protection gone. Zam lands 2 of 5 detonators and you can see where this one is going… Han’s counters and guarded assists are killing me – literally (in-game). IG-88 is down, Boba is at half health, Bossk stunned – this is not good. I just landed a few detonators and had Zam Spam the Rebels (Zam Spam – that one is catchy), but traded out Lando for Bossk – not a good deal IMO. One more shot from Zam and the Guarded blue buff shows its teeth and the assists and quick Rebels finish me off. So here is where real life kicks in. I have a full, long day ahead of me that I cannot really work around. My hope it to be fighting again by 4 or 4:30 pm ET. If there is one takeaway from this event it is this – it is HARD. If you like a good challenge you are in the right place. Start switching mods around – that is what I am going to do. Good luck! So far this is going as I expected. I will gear up a bit after a week of gear hoarding and try a few new mods and will be back online as soon as I can. Alright, it has been a long day, but I am back online and ready to fight soon. I have added a lot of Speed but still I am not using my Arena mods. RL is catching up again – I may not be able to complete this until tonight. We will see. First off, my apologies to anyone who has been waiting for updates today. I had a prior (work) engagement today before the event was announced, and then a busy evening as well with both kids in youth sports. It is now 10:15 pm ET and I still have not attempted Tier 7 which I expect to be incredibly hard given what I have already experienced. I fought this twice to see how it would go and the RNG was NOT on my side in the first try. I started to get a little discouraged so I tried again. In the second attempt they took out Zam right away and Boba was down a revive and in the yellow, but they made the mistake of NOT finishing him off. R2-D2 put Stealth on his Rebel friends so I teed off on him and finally took him out. After losing IG-88 I took down Lando leaving me with a close 3 versus 3. After the stealth wore off of Chewie I focused on him, finally getting Boba’s special to take him out. Then Bossk’s special called all Bounty Hunter allies to assist to defeat Leia leaving Han Solo against my three. Again, somebody should have told him the odds were in my favor. With Chewie unlocked (and now I have him at 7-stars), here is my best mods for Chewbacca article that I wrote after testing him out in the GameChangers environment. Also, in case you missed it, here is AhnaldT101’s unlocking 7-star Chewbacca for FTP video. Be the first to comment on "SWGoH: One Famous Wookie – Chewbacca Event Live Blog"